This pose benefits the yogi by strengthening and stabilizing the muscles of the legs and feet. It also strengthens the shoulders,arms, and back. It stretches the hip flexors and calf muscles and improves balance and concentration. Start in Utthita Hasta Padasana (expanded arm and leg pose), then turn right foot and leg out completely, left foot in at least half-way. Turn the hips, abdomen, ribs and chest to the right, then bend right knee to a 90° angle. 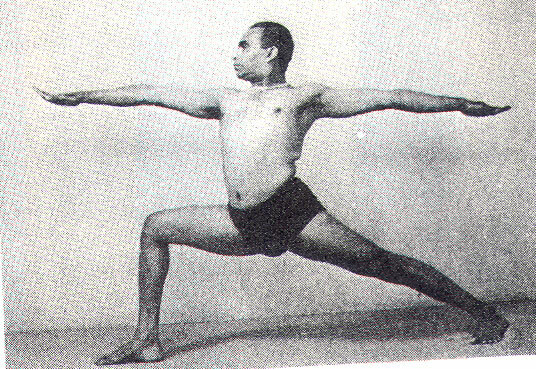 Variations: (a) hands on hips, (b) arms to the side (Vimanasana—Airplane Pose), (c) arms up (Urdhva Hastasana or Urdhva Namaskara). Press outer edge of left foot down and lift arch of left foot. Keeping arch lifted, press left big toe ball mound down and lift outer left thigh up into hip, and turn outer left hip forward. Turn outer right hip back so that hips face evenly to the side wall. Press the front of right heel down and extend inner and outer edges of right thigh evenly forward. Balance the following opposing actions to get an integrated stretch throughout the spine; Move the inner legs away from each other while compacting the hips. Lift the back inner thigh of the left leg while moving the buttocks down away from the waist. Take the tailbone in to lift the back ribs away from the waist while moving the shoulder blades in and down the back. Lift the sides of chest and sternum while relaxing the shoulders away from the neck. For all variations of arm positions, turn the upper arms out and use the arms to lift the sides of chest more. Stay 20-30 sec and repeat to the left. Urdhva Hastasana, Vrkasana, Utthita Parsvakonasana, Prasarita Paddottanasana, Adho Mukha Svanasana, Baddha Konasana, Upavistha Konasana, Supta Buddha Konasana, Supta Virasana. Don’t take the arms over the head if you have uncontrolled high blood pressure. It is important not to over arch the lower back while doing the pose. Keep the head in a neutral position if you have neck problems.